Discussion in 'Article Discussion' started by arcticstoat, 8 Mar 2011. What a great idea. I'll have to trawl through my old photos tonight, as I'm sure I have pics of a hamfisted attempt I had at creating some blow holes in an old PC. This was pre-Dremel and I didn't have the proper cutting bits for my jigsaw. Trying to fix the mess with some acrylic sheet and hot glue did nothing to improve matters. Just about any Mod i have ever attempted!! im glad its not car mod horrors. I would not want to show a picture of the engine bay of my very first car when i was young and didnt know any better. Lets just say a full spray can of silver metal paint was used to cover up a larger persentage of engine bay. it was a old 800Mhz compaq machine, it smelled really bad already and it would not start up they told me so took it home for a better look. the outside should have been white/gray but was sigarett yellow the side was kicked in and the mouse was a 2 klik with one missing the keyboard was yellow and sticky. After opening it up and first finding dried up bread peaces, and a lot of black little things in the corner some tor up fabrics, dust and paper underneath the hard disk rack, i put it on the side and got a lamp in there. I really had a hard time keeping my lunch in, the fabrics and dust were a mice home and well one of them got well splattered bij the PSU fan all over the top off the mainboard, some parts were fried on there really won't go in more details it was the worse thing i ever seen and i seen my share of burn outs and dust bins in the 15years im doing this.. I once dropped a screwdriver from standing height on a newly built rig, still open and on its side while checked first boot. BANG and then that blue smoke that smells weird, there was a big welt on the mobo where it had landed point first on the board just below the CPU. When i tried to boot (well you've gotta try) would only recognise one stick of ram and behaving rather erratically, eventually it died completely later that day. I wish I'd had a camera about at the time! it was around 2006 and I was building a 939 system for my sister, I did keep the board for a while to show people but it ended up getting chucked in my last clearout. But I later found that the CPU, RAM, and PSU were fine, just the cost of a new board and a near heart attack then! Who had a camera then? All my horrors were before camera phones, and when you get that sick taste in your mouth the last thing you wanna do is take a photo. Add to that, the fact that you don't really want to advertise just how big a numbskull you were; and you certainly don't want photo evidence. In hindsight, yes, you can laugh about it. At the time, however, you're either distraught or severely embarrassed. WIll you be judging with perfect 20 20 hindsight? The following is a picture of a companies main connection to their server. The company in question moved their server across a room - No one knows why - and discovered there were no network points. No fear! They had access to a drill and a few masonry bits, so away they went. Except, they didn't count on the size of the RJ45 plug, so of course, the cable wouldn't fit. Still, no worries, there's some side cutters and tape! Their speed to the server, unsurprisingly, tanked completely. 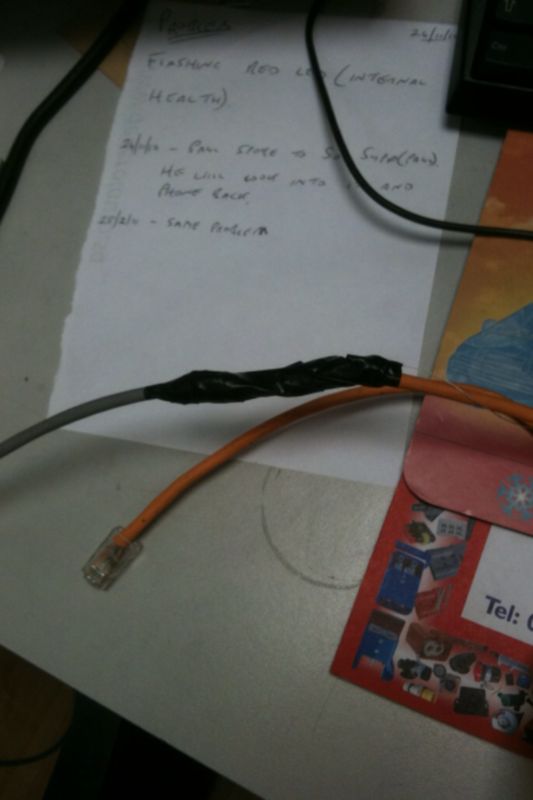 Yes, the connection is held together with electrical tape, yes the cables are twisted together. My most head scratching encounter was when I went to a garage to do a physical and data cleanup of the PC's there. I expected them to be filthy, I mean, it is a dirty environment. For the most part, it was just dust colonies. Seriously, they'd developed space travel. One machine, though, that was off the ground, away from most of the muck, and looked pretty good. Until I opened it. Sadly I didn't have a camera, or a camera phone, but it was literally coated with engine oil on the inside. Now, I don't mean there was a puddle, I mean the oil had become a sticky, matted, affair on everything, as if it had been introduced to the dust and dirt, then painted over every component in the PC. How the machine was still running, I will never know. Sadly, I don't think I've caused any "meltdown" disasters.. If I had a photo of my face the day I performed a c:\>del *. * thinking I was on the floppy a:\ it would be win win. I remember the horror sweeping over me as it dawned what I had done to my Dad's ICL workstation. Fortunately it wasn't the infamous deltree or I probaby wouldnt be typing this now!! Did the most natural thing any 13 year old boy would do and flatly denied doing anything wrong - even though it was nailed on to be me. The joys of DOS 3.3! The look on a friends face after he realised he'd just cooked the gpu on his 1 day old 4870 his cash strapped parents had brought him the day before for Christmas and he rather stupidly ran a full furmark test. He ended up buying a new card later that week and pretending his parents gave that one to him. I've had a fair few over the years. Never took a picture of them though, I just shed a few tears, binned the offending parts and pretended nothing untoward had ever happened. During my early days of system building I spotted some thermal conducting tape in Maplin, and figured it would be less messy than TIM, so why not give it a shot? So I stuck it down on my brand new, shiney dualcore Athlon, pushed the HSF on top and booted up. Turns out thermal tape isn't suited to CPUs. Come on people, still no pictures! Once I left the temperature gradient in the oven, by heating lead-free card. As a result, not only external changes, but the death of the GPU. The second lot I can offer you the remainder of the unfinished custom case, which has become a test case for agp cards. Was backing up a users laptop a few years ago by connecting the hard drive to my main desktop system. Accidentally bend one of the pins over when I plugged the IDE cable in. I'd never seen a flame shoot up an IDE cable before, I tried desperately to power down the machine before it reached the motherboard but I got there about half a second too late. I think the only thing that didn't get fried in that machine was the Floppy drive... explaining to my boss that not only had I killed the laptop drive but my machine as well was NOT fun!